Civil liberties activist Timothy Edgar describes how he tried to make a difference by going inside America’s growing surveillance state as an intelligence official in his new book, Beyond Snowden. Edgar explains how Snowden’s leaks of top secret documents led to reforms that made the NSA more transparent, more accountable, more protective of privacy—and, contrary to conventional wisdom, actually strengthened the NSA by making it more effective. While the reforms implemented by the Obama administration were a good first step, much more needs to be done to prevent abuse. Donald Trump’s election in 2016 prompted fears among both civil libertarians and intelligence officials that a new president would abuse his national security powers. The United States leads the world in mass surveillance. In Beyond Snowden, Edgar explains how the United States can lead the world in surveillance reform. 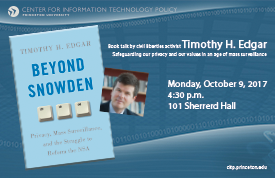 Timothy H. Edgar is a former national security and intelligence official, cybersecurity expert, privacy lawyer and civil liberties activist. Edgar joined the American Civil Liberties Union shortly before the terrorist attacks of September 11, 2001, and spent five years fighting in Congress against abuses in the “war on terror.” He left the ACLU to try to make a difference by going inside America’s growing surveillance state – a story he tells in Beyond Snowden: Privacy, Mass Surveillance and the Struggle to Reform the NSA. In 2006, Edgar became the intelligence community’s first deputy for civil liberties, advising the director of national intelligence during the George W. Bush administration. In 2009, after President Barack Obama announced the creation of a new National Security Council position “specifically dedicated to safeguarding the privacy and civil liberties of the American people,” Edgar moved to the White House, where he advised Obama on privacy issues in cybersecurity policy. In 2013, Edgar left government for Brown University to help launch its professional cybersecurity degree program and he is now a senior fellow at Brown’s Watson Institute for International and Public Affairs. Edgar also works to help companies navigate cybersecurity problems and is on the advisory board of Virtru, which offers simple encryption software for businesses and individuals. the Los Angeles Times, the Guardian, Foreign Affairs, and Wired, and he is a contributing editor to Lawfare: Hard National Security Choices. Edgar was a law clerk to Judge Sandra Lynch, United States Court of Appeals for the First Circuit, and is a graduate of Harvard Law School and Dartmouth College.